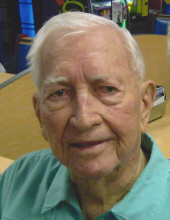 Crabtree, Clinton Monroe, 94, of Wesley Chapel, passed away on Monday, January 28, 2019. A native and life-long resident of the Tampa area, he was a member of the Brandon Masonic Lodge #114; Egypt Temple Shrine, Charter President of the Brandon Shrine Club, Charter member and Past Exalted Ruler of Brandon Elks Lodge #2383 and Past District Deputy. He is survived by his wife, Sheila Gardner Crabtree; daughter, Robyn Canty and grandson, D.J. To send flowers or a remembrance gift to the family of Clinton Monroe Crabtree, please visit our Tribute Store. Florida Elks, Harry Anna Investment Fund, Inc.
"Email Address" would like to share the life celebration of Clinton Monroe Crabtree. Click on the "link" to go to share a favorite memory or leave a condolence message for the family.